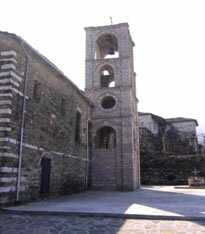 The Church of St. Sotirë is open daily from 07:00 to 07:30 and 19:00 to 19:30. Sunday services are from 07:00 to 10:00. Visitors are welcome. Tours or visits outside of regular hours can be arranged through the Tourist Information Centre. Situated in the Old Bazaar district the basilica was built in 1784. The design is typical of the Orthodox style in its rectangular shape and east-west axis construction. The church, also called the Old Metropolitan, used to be the seat of the local Orthodox bishop. Typically Orthodox churches are built to represent the universe. The domed ceiling represents Heaven and is decorated with a large painting of Christ looking down upon the assembled congregation. The floor represents this world. The main altar is raised from the floor at the top of a flight of steps as though suspended between Heaven and earth. Near the entrance, there is an icon housed in a hand-carved stand that symbolizes the divine transformation of Christ. The interior of the church was heavily damaged during the communist era. Little remains of the original murals on the rear walls. The framed icons on both sides of the altar and rear wall were painted recently by a local artist who specializes in religious art and restoration. The hand-carved chair in the main part of the church (the nave) was originally intended for the Orthodox bishop. Decorative metal candle and incense holders, called censers, are suspended overhead. The third part of the church, the sanctuary, divides the nave by the ornately carved iconostasis. Its purpose is to restrict entry into the sanctuary by anyone other than consecrated officials of the Church. The screen has two tiers. Along the upper tier there is a collection of small framed icons, these are originals dating from the 18th or 19th century. Most of the icons in this church today are reproductions as the originals, removed during communist years, were never recovered. The mosque in the Old Bazaar is open daily. Admission is free and visitors are welcome. The best time to visit is about 15 minutes after the five-times-daily call to prayer when the imam is present. It is thought that the mosque was spared destruction by the communists in the late 1960s because of its status as a cultural monument. 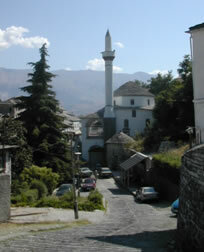 Twelve out of the thirteen extant mosques in Gjirokastra were destroyed during this period. Following the religious clamp down the mosque was used as a training hall for circus acrobats who made use of the high domed ceilings to hang their trapezes. Originally, the mosque was part of Memi Pasha’s plan for the New Bazaar that was built in the 17th century. It was destroyed by fire in the following century. The octagonal-shaped building on the west side is used for the ritual washing of hands and feet before the faithful enter. According to religious custom women pray separately from the men and have their own entrance. The area underneath the entrance portico used to be occupied by shops. Money collected from the merchants was a source of income to support the maintenance of the mosque. The largest room inside the main door is used for prayer. The indentation in the opposite wall is the mihrab, where the imam stands oriented towards Mecca, the direction to which Muslims turn when they pray. The small staircase (Minbar) to right of the imam’s place is where he delivers his weekly message during the midday Friday prayers. Access to the minaret, which has 99 steps and represents the 99 names of God as given in the Qu’ran, it’s in the corner. Nearby you will see a yellow building that looks a bit like a mosque with its domed roof. This two storey octagonal building, constructed in 1727, used to be a Bektashi tekke. It was closed down during the communist period. Today it is a madrasah (Muslim school). The Seven Fountains are built into the foundations of the Meçites mosque, originally known as the mosque of Hadji Murad (Murad the pilgrim). The sound of the running water can be heard at some distance and you will hear it as you approach. The remains of the minaret tower are immediately to the right of the fountain. Destroyed by the communists a house now stands on the mosque’s original foundations. Walk down the three steps to see the remaining fountains, some of which are still in operation, with their beautiful accompanying dedicatory inscription. In these fountains the faithful ritually cleansed themselves before attending prayers in the mosque. On the other side is a Hamam, a traditional Turkish bathhouse, currently closed and awaiting restoration. The roof of the Hamam has been recently repaired by the Gjirokastra Conservation and Development Organization.